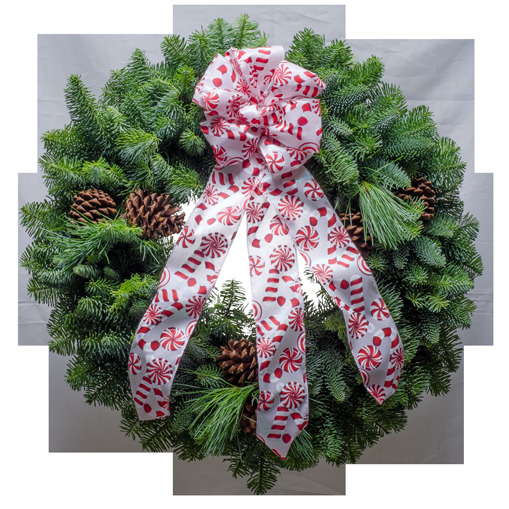 The candy cane Christmas wreaths are decorated with a taffeta red and white bow. The bow fabric has images of Christmas candy. Paired with the beautiful forest fresh evergreens of the northwest, it�s a perfect match. Merry Christmas! "Oh how beautiful! When our wreath arrived, I opened the box slowly, thanking you for the care that was taken in the preparing and packaging. I love the smell that fills the air as I open the bag. So fresh - so beautiful - thank you so very much!"